Taking into account time and budgetary constraints, most organizations can’t afford to make mistakes about where and how they allocate resources for storage. This means storage solutions must be sourced and operate efficiently, as well as eliminate the top two challenges many IT leaders cite as hindrances to their infrastructure: aging equipment and inadequate storage capacity. That’s why Principled Technologies did the heavy-lifting for you and tested Dell EMC Unity 550F AFAs against other all-flash array options to help your organization make an informed investment. 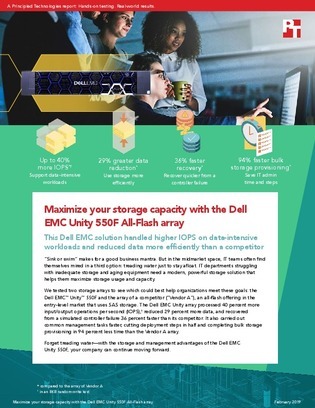 Download the paper from Dell EMC and Intel® for a full comparison of IOPS processing, performance, recovery from controller failures, bulk storage provisioning, and execution of management tasks.